In the wake of the ever rising demand for reliable products, we are engaged in offering a wide assortment of Hand Sleeves /Arm cover. 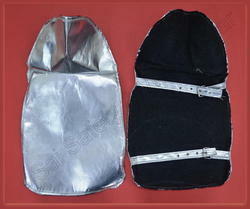 The wide range of products offered by us includes Sleeves, Cotton Yarn Knitted, Jeen Cloth Made, Leather Sleeve arm cover.Hand protection sleeves are of various type according to the application likecotton yarn knitted, jeans cloth sewn, leather made, kevlar etcThese are made of thick cotton loop pile. This sleeve is 14 - 20 inches long covering the whole of the forearm.Asleevesis the part of agarmentlikeYarn Knitted, Jeans Cloth,Leather, Non Woven and Nylonthat covers thearm, or through which the arm passes or slips. The pattern of the sleeve is one of the characteristics of fashion in dress, varying in every country and period. Various survivals of the early forms of sleeve are still found in the different types of academic or otherrobes. LeatherCreated by the tanning of animal hide, this material is very durable and exhibits good thermal and burn resistance properties. The most common leather comesfrom cow and pig hide, though other options such as deer or elk are produced.Leathers dry considerably over time. Leather products are either top grain or split grain--a cutting/tanning method used to make the product less abrasive to skin. Cotton While cotton is very flammable, chemically altering the cotton's structure is an effective means of adding fire resistance to the product. It has better flexibility than leather, but lower durability.Sateenis a derivative of cotton accomplished by mercerization in caustic soda. It has a softer feel and a different thread technique but also flame resistance. 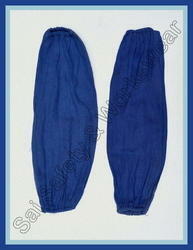 Cotton is also regularly intermixed with nylon fibers. we’ve established that wearing gloves with reliable cut resistance in workplaces where cuts are a big threat is crucial. However, though it may come as a surprise, many people don’t realize that depending on the application, sometimes, your arms will be exposed to the same cut hazards and therefore, they also require reliable, cut-resistant PPE. Disposable and waterproof protective Kevlar Leg Gourd made of PE-foil with elastic bands on both sides to ensure maximum protection. Available in white and blue. 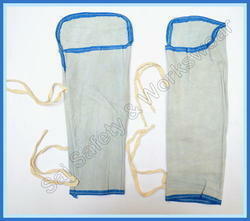 The Kevlar Leg Gourd consists of fluid repellent film. They are tube shaped and each end is closed up by an elastic strap. Elastic Tested for harmful substances according to Standard 100 Raw Material. These hand sleeves are made of pure cotton yarn on automatic Japanese machines. 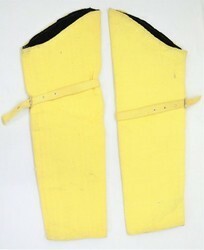 These sleeves are customized according to the user"s requirement. 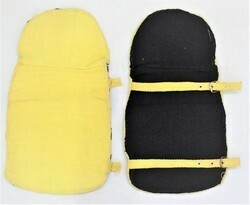 They can vary in weight also like 55 to 120 grams per pair according to user"s requirement. High Quality: Made of Dyneema Fabric--30% LIGHTER than nylon/polyester, 4 times STRONGER than leather, 15 times STRONGER than steel (proportional to the mass). Durable and Food Safe, not-toxic, not smell. BEST DEFENSE for your amrs and wrists. Sold as One Pair. One Size Fits All: 17" length. LIGHTWEIGHT & BREATHABLE & STRETCH fabric with thumb hole, gives your arms a secure and snug fit, cool and comfortable to wear. High Performance Protection: Certified Level 5 Cut Resistant Protection, Abrasion Resistant, Anti-slash, Prevent Scrapes ,Scratches, Skin Irritations, UV-Protection. Applications:Cut protection, Food service, Gardening, Wood carving, Farming, Fishing, Camping, Glass handling, Assembly line, Appliance installation, Warehousing, etc. Leather Leg Guard is compact and light weight so that it occupies less space and becomes easy to transport. 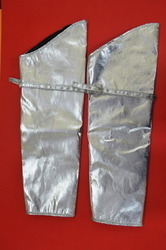 Hese heavy duty aluminized Sleeves can withstand short duration exposures to temperatures up to 300 deg celcius on palm, and 400 deg celcius radiant heat on back. Moderate or poor abrasion resistance can be expected.